There’s a truism in critique circles that when reviewing a restaurant, a film or even a golf course, one should sample them twice before making a final studied opinion. If reviewing a high quality golf course destination, that’s especially sound and fair-minded advice because one can catch even the best resort on a bad day, service-wise, or miss something integral in a layout’s design. However, I must confess that wasn’t my rationale for returning to Streamsong, the highly acclaimed and well-publicized golf resort tucked away in north central Florida. Last April, I loved the place at first glance. I marveled not only at the property itself, but the creative and expansive thinking that propelled the entire project. On the way to the Masters, I only had time last year to play the Blue course, designed by Michigan’s Tom Doak, The Blue course provided an exceptional golf experience dampened only by a slew of three-putts. The demands of the greens were challenging especially with tough pin placements that day. However, they were somewhat offset by wide, generous fairways and frequent open approaches to them. And Doak’s trademark minimalist design philosophy—an artful discovery and shaping of natural land forms—was impressively on display. The advance scouting book on the Red course, designed by Ben Crenshaw and Bill Coore, was that it was less forgiving off the tee than the Blue but was more benign around and on the greens. In sum, that’s a fair and accurate assessment. Unlike the Blue, the Red starts off with a jolt as the first two holes are the no. 4 and no. 2 handicap holes. Yet, they didn’t bother my brother-in-law who parred the first and birdied the second and was net three-under par for the day. I particularly liked Red holes 7-8-9 and how they offer a string of good scoring chances with a shortish par-five, a short par-three and a short par-four. After posing a tough start, Crenshaw and Coore eased off the pedal, letting players relax a bit as they end the front side. As one of the Streamsong pros aptly described the trio, “They’re favorites because they allow players the chance to score but they’re not pushovers.” Those words proved prophetic as I birdied the 119-yard 8th hole while two of my playing companions carded doubles. The par-three 16th hole also got our admired and undivided attention. It’s a companion “signature hole” to the Blue’s par-three 7th hole which sits near by and in parallel fashion. With an elevated tee and a daunting carry over water and huge bunkers, we played it at 184-yards and no one’s tee ball found the putting surface. The designers allowed for an ample bail-out area left of and below the green but it required a deft chip or a hearty Texas wedge to make par. Overall, the Red’s 16th matched the Blue’s 7th as a scenic yet ornery test. Last year, I was given a cart tour of the Red and I noticed its turf quality was not as mature as found on the Blue. This was due to the fact that its first six holes were the last to be grassed during construction. Now a year later, I can attest the conditions now match the quality of the Blue. In spite of a heavy downpour the day before, the Red’s turf remained firm and tight and offered a linksy bounce and roll. Okay, at this point in the proceedings you’re ready to say, “Yeah, yeah, but what do you think about the playing experience of the Red? Does it complement the Blue?” Cutting to the chase, the Red and the Blue are worthy companions and each delivers a stirring golf journey requiring imagination and solid shotmaking. And they’re best experienced on foot and with a knowledgeable caddie at one’s side. (Our caddies were all excellent and provided good lively banter.) In today’s travel parlance, these fraternal twins are meant to attract the “big game hunters” ever bent on tracking down the rare, exotic and most select layouts. The courses are different in subtle ways but they’re congruent in their thoughtful and deft use of the landscape. Three pieces of advice before playing Streamsong: 1) Like all luxury items, expect to pay a premium here but then get over it. Treat the experience as something special, like fine dining or great seats at a concert. 2) Don’t get too score-conscious and allow numbers on a card to ruin your round. Play match play or a form of Stableford where high scores can be more easily accepted and dismissed. 3) Don’t be too hurried or rushed but play briskly and with dispatch. Heeding advice no. 2 will help in this regard. If you do none of the above, that’s okay, too. Just get there. 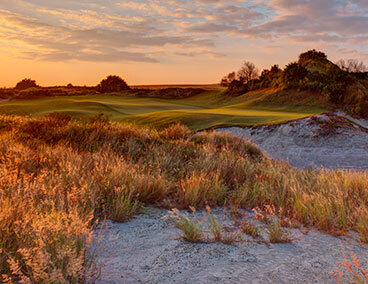 A brief commentary about the hotel at Streamsong. Last year, I was blown away by its singular and minimalist design and thematic attention to detail. In my view, the hotel broke the mold and set a new standard for golf accommodations. After a return visit, that’s still my opinion and I’m sticking to it. On this occasion my wife joined me and since she didn’t play golf we took the opportunity to experience the Streamsong spa called AcquaPietra (Water Stone). And were we ever ready for it! We arrived after a long day in the car, including several hours handling heavy Orlando traffic in a rainstorm. AcquaPierta, located on the lower level of Streamsong hotel, is a tranquil and elegant space in a manner of a European grotto sanctuary. Masterfully designed by Alberto Alphonso, it’s reflective of his themes and philosophy behind the entire architecture and space at Streamsong. With lower and soft lighting, it imparts a calming and comforting ambience with minimal distractions. There are nine treatment rooms and six different pool experiences along with sauna and steam rooms. The facility more than met our expectations. Possibly the only shortcoming was with the men’s and women’s locker rooms. They’re well-appointed but are somewhat small and cramped for space. One hotel guest grumbled to me about the room only offering one shower. But neither my wife nor I grumbled about the therapists who expertly provided us with deep muscle massages. They were congenial, knowledgeable and highly effective in their craft. After a 90-minute visit to the spa, our tight neck and back muscles disappeared—like the memory of that Orlando traffic—and we felt rejuvenated. AcquaPierta delivered on its peaceful promise.